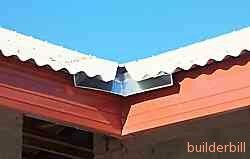 One of the roofing pages shows how to calculate the angle of a valley or hip flashing, known as the dihedral angle. DIY and home improvement jobs are great to do. They can provide a sense of self satisfaction and sheer pleasure that you actually did it yourself. You can also save money right from the start. If you don't want to do it yourself , but would like to know more of the background stuff so that you can check that your contractor knows what he's doing, there are sections here that you will find helpful. Maybe you're a young guy starting out in the job and need a bit more practical information than your short course on Carpentry taught you. Dig in deep, there's heaps of information here. 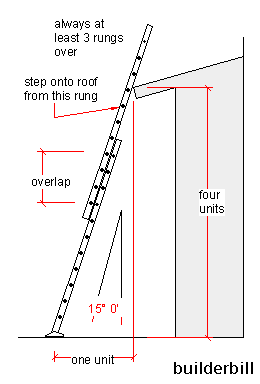 In my roofing section there is a page on ladder handling. DIY - A shot that will be added to the bathroom renovation pages. 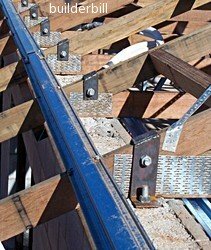 DIY - A couple of battens screwed to a steel square makes it useful in roofing and stair building. Are there dozens of little fix-it-up jobs that need doing around your home? Read the tools sections, buy a few basic tools and learn how to use them, it's not hard. Have a go, DIY, enjoy yourself and get the satisfaction of jobs well done. Do you want to renovate your home or build an extension, but the quotes you have received are too expensive? You might be able to afford it as an owner builder. You do all the legwork, running around and organising. You can also do most of the labouring and semi-skilled work. 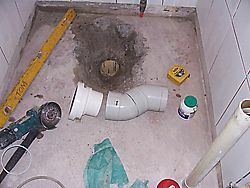 Then you use sub-contractors for the specialist work. It's not easy, a builder doesn't get his mark up for nothing, but it's not rocket science either. Concreting may not be to you taste (and I don't blame you) but for those who want to give it a try, or to just to understand a few basic principles, try my concrete intro page and then move on from there. Closely related to concreting, is the all important formwork. In that section I must admit I have gone into it a lot more than the average home owner needs to know, but I have been getting excellent feedback from guys in the trade, and even a TAFE (apprentice training) college has shown interest in using some of my material. Once again the Formwork Intro page is not too technical and good value for any home renovator. The photos on this page are just a sample of the more than two thousand original photographs and sketches that are on this site. I have worked since the age of sixteen with plans and drawings and I'm not about to change now. As the old saying goes, "A Photo Is Worth A Thousand Words". 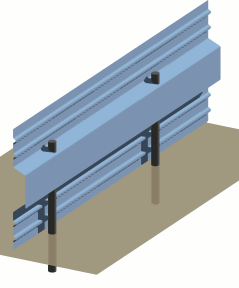 The section on doors obviously reflects my trade background in carpentry and joinery, but I also like to think that some of my 3d drawings in this section and on some of the roofing pages make it a lot easier to grasp the basics. Is your bathroom looking dated, chipped, moldy or leaking? It's a fact that bathrooms are the most expensive rooms per square metre in the home. If you can put up with a bit of inconvenience while you are doing it, you could save heaps and add value to your home by doing a bathroom renovation yourself. Start at the Ceramic Tiles, setting out and tools page. My photo at the top left, shows me reaching for a pencil behind my ear. That most basic form of communication, drawing, is alive and well on this site. There are no pencils here, but when I am sat at my CAD program I hope that I am passing on my information just as effectively as the tradesmen and builders who taught me, years ago before CAD and digital cameras came onto the scene. A word before you dive in. There are an awful lot of building techniques that I don't know anything about. Nobody can ever know it all. What you get here is some of what I have learned from trade school, but mostly from on the job practical experience. I am not about to trawl the net for a mish mash of opinions and call them my own. There's enough of that out there already. Having said that though, I have had very valuable exchanges with some of my readers and already I am learning a lot about methods and the way things are done in other countries. Quite a few of them have contributed to articles on the site and I thank them all. What we are about is exchanging information. Right at present I am heavily into a huge DIY project, yes, you have maybe guessed what it is, building this website. It has pushed me well out of my comfort zone, I'll give you the drum. DIY - This masonry drill is in the Electric power tools page, and in the hammer drill page. It is worn out and retired now. Tell me about it! "Welcome on site, have a good look around. Duck under the scaffolding and go for it!" Thanks for sharing your knowledge and making the effort to produce a great, useful website. I wish I found it before I started renovating! Stewart Brisbane Aus. Your pages are one of the best regarding the roofing on internet! Thanks so much for your speedy reply. I followed your advice and simply covered the fluff......Well, thanks again for your helpful reply. I will certainly visit your site again. I have bookmarked it. I bought a house in .... Co Tipperary here in Ireland last December.......Your website is 100 percent, you could easily publish the contents, make a mint and retire to a country with a nice climate like any where except Ireland. Thank you very much once again for your quick response and advice. First of all it has taken a lot of pressure off me as I was confused about what to do next and your suggestions really answers my problem. I will be sending the plans to my carpenter for the necessary arrangements and I'll give you feedback on it in due course. Thanks to the folks above. Plus the many others, who have asked me questions, given me encouragement and helped me with the site. You are doing a good job keeping an old fart out of the pub".